Omkarananda Saraswati To His Devotees "Prabhuji"
To bless all those children on the holy path to Self-Realization, Lord Kalabhairava decided to take his place amidst the holy chanting of the divine mystical syllables in the vibrating land of Omkarananda Ashram at the holy feet of the Himalayas. It all began with a phone call from the Omkarananda Ashram Switzerland to the Omkarananda Ashram in India that an outstanding, noble and very divine personality was coming to visit Omkarananda Ashram Himalayas. Finally, Shri Prabhuji along with one of his disciples came and stayed in the Ashram for a day and a night. He was absolutely attracted to the place and after visiting the holy river Ganges he could not stop his tears of emotions and devotion. It was at that time when Shri Prabhuji approached the authorities of the Ashram to find out if they would allow the statue of Lord Kalabhairava to be erected. Accepting the gracious offer, it was decided that a Murti would come from Pune to Rishikesh. 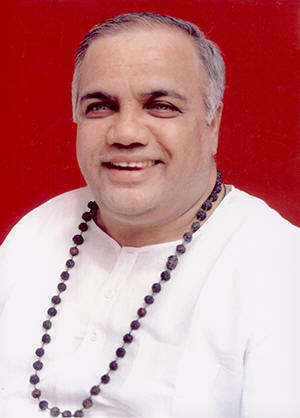 While fulfilling his mission, great Prabhuji took his journey into Mahasamadhi. A few weeks later a disciple of Shri Prabhuji came in a small Maruti car with an around 250 kg heavy statue of Lord Kalabhairava. We may consider it so or not, but it can be treated as a small wonder that through the jungle of this enormous traffic from Pune the car reached Omkarananda Ashram safely. With the help of many people the Murti was brought into the holy Yagnashala of Omkarananda Shanta-Durga Mandir, where the Lord was smoothly placed, sprinkled with holy Ganges water, offered flowers and last but not least some good smelling perfume was sprayed on him. All the priests came together, offering their Adorations to the great Lord, who came to bless us. Amidst powerful chanting and great rituals, finally the Lord was requested to stay there till the proper temple for Him would be erected. With the great assistance of Prabhuji's disciples together with Omkarananda Ashram a wonderful temple was built situated near the window of Omkarananda Yoga Sadhana Kutir, where Prabhuji spent his night. The priests of Omkarananda Ashram made all the necessary rituals in a highly divine and scientific way to make this spot a place of extraordinary worship. When Bhumi Puja for the Kalabhairava Temple was performed, there was another surprise in store by Lord Kalabhairava for all those who were very active in making an elaborate Puja. When in the nick of the moment an inspiration came that a golden piece should also be attached to the different kinds of items that were necessary for offering during the Bhumi Puja, it was a sheer surprise, that the particular priest who was sent to bring this piece of gold, was given a gold-coin, on which the picture of Lord Kalabhairava was imprinted. 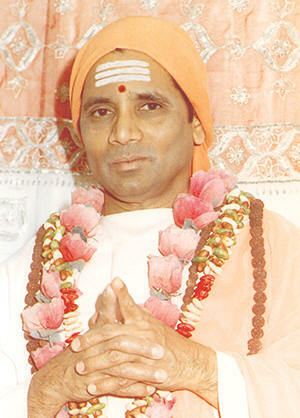 With great effort, selfless devotion and dedication, the disciples of Shri Paramahamsa Omkarananda Saraswati went into high class actions, using their skills and technical know-how to bring up a temple in the shortest period of time and to make the holy place of Lord Kalabhairava a place where all those great spiritual seekers, who are deeply devoted to Lord Shiva can come and take his blessings. It was no doubt the great spirit of the wonderful Mystic and Sage Shri Swami Omkarananda who must have guided his disciples to assist in everything, in order to make that wish of holy Prabhuji in the fastest and the finest way possible. One of the eight manifestations of Lord Shiva, Lord Kalabhairava primarily denotes the march of time. A hymn dedicated to Kalabhairava, succinctly brings about this attribute that is linked to this Deity. The hymn speaks of time being the most precious of the commodities and instructs wise people to use every moment of time effectively. Kalabhairava Himself helps each of us to make one's time useful. Apart from being the manifestation that oversees the march of time, Lord Kalabhairava is known as the guardian Deity of a temple, or Kshetra Pala. The keys of the temple are ceremoniously placed at his feet after closing the doors and taken back with his permission before reopening them. He is also invoked when pilgrims and travellers set out on their journeys as he is the protector of each journey that is taken. Lord Kalabhairava happens to ensure that we reach our destination safely and on time. The mount of Lord Kalabhairava is a dog. This motivates the devotee to do bhuta yagya - loving care of animals. Pending Problems: Problems which have been pending for a long, long time can be solved by praying to Lord Kalabhairava. Also inordinate delays in achieving results can be reduced. Time Management: Those who are unable to improve time management and tend to fritter away their time on trivial pursuit should pray to Lord Kalabhairava. Malefic Planetary Effects: If you have malefic planets in your lagna or when natural malefic planets are transiting, you must pray to Lord Kalabhairava to remove and protect you from these effects. In Indian astrology, Rahu plays an important role in the life of a creature. Astrologers often suggest worship of Lord Kalabhairava to reduce the evils caused by the malefic position of Rahu. Siddhis: Bhairon or Bhairava is regarded as the guardian of Yogis and Tantriks who attain accomplishment of Mantras by doing Sadhana. 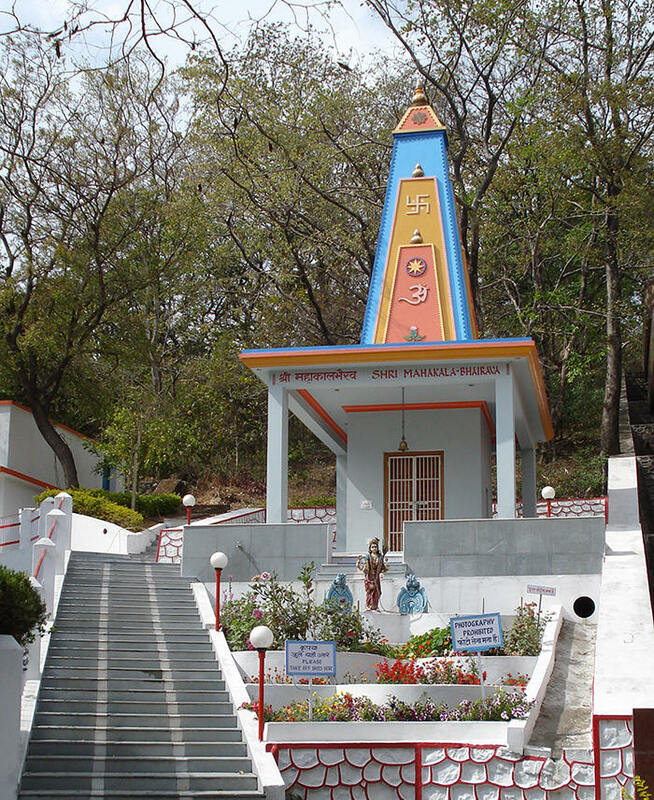 On the auspicious occasion of Mahashivaratri, the Kalabhairava Mandir has been inaugurated with traditional Pujas and Hawanas in a two day function on 5th and 6th of March 2008. To see the photos of the function, go to the Photo-Gallery. You may click on the thumbnails to get a larger image. Right-click to download the photo. A Video DVD of the function (2.5 hours) will be available shortly. Those interested may kindly contact us on omkara@oah.in. Mandal-Abhisheka for Lord Kalabhairava was held on April 19, 2008. This function is celebrated 45 days after the Prana-Pratishtha (Installation) of the Deities. The significance of this Pooja is to invoke and worship the Parivar (Ashtagana) of Lord Kalabhairava. One Mandala corresponds to a period, which is defined to be 45 days. In the presence of Ashram members and other devotees, Pandit Suresh Joshi, Chief Priest of Omkarananda-Kamakshi-Devi Mandir, along with other Priests, performed the Hawana, Puja and Abhisheka with great devotion and sincerity. Anyone who wishes to contribute to the Kalabhairava Mandir, can do so by visiting our Donation Page. For your prosperity, peace and happiness, we can perform Puja, Abhisheka and Hawana in Kalabhairava Mandir in your name, your family's name or in the name of your friend, relative, etc. for a one-time contribution of Rs. 5000.- (approx. US$ 100.-). Prasad of the Puja / Hawana will be sent to you. for whom Puja is to be performed. In case of families, you may mention the names of all family members. on which Puja is to be performed. One day for every subscription. If possible, Gotra of the person(s) for whom Puja is to be performed, may kindly be given. where the Prasad is to be sent.